It may not be springtime, but allergies are just as present during the fall and winter months. Since it’s cooler out, chances are that you’ll be spending more time indoors, so make your home as allergy resistant as you can with these tips from the Asthma and Allergy Foundation of America. Reducing humidity decreases dust mite and mold growth. Air conditioners help reduce the humidity as well as prevent the exposure of outdoor allergens. You can reduce the number of outdoor allergens such as pollen and mold from entering the home by keeping windows and doors closed and the air conditioner set on recirculate. Control dust mites by keeping surfaces in the home clean and uncluttered. It’s best to have bare floors and walls, especially in the bedroom where you spend one-third of your time. If you must have carpet, opt for throw rugs that can be washed or low-pile carpets. Put zippered allergen impermeable or plastic covers on all pillows, mattresses and box springs. Encasing mattresses works better than air cleaners to reduce allergy symptoms. Every week, wash bedding, uncovered pillows and stuffed toys in hot water (130 degree F.) to kill mites. Vacuum once or twice weekly to keep allergens to a minimum. Poor-quality vacuums can put dust into the air, so look for asthma friendly certified devices. Wear a dust mask while doing housework and use a damp or treated cloth for dusting, then leave the house for several hours after cleaning it. This helps prevent pollen from entering the home. Run the air conditioner in warm weather to helps control dust mites by reducing humidity, and change filters often in window units. Reduce moisture in the bathroom, kitchen, and other water areas around the home. Use a dehumidifier to help reduce both mold and dust mites and fix all leaks and other causes of damp areas. Do not leave food or garbage uncovered. 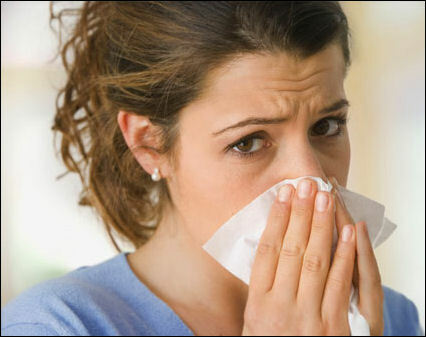 Use poison baits, boric acid and traps rather than chemical agents that can irritate rhinitis and asthma.